Everything from the EasySIGN Starter license plus a lot more. EasySIGN Master redefines the term "Complete". Everything you need to design and produce powerful designs. 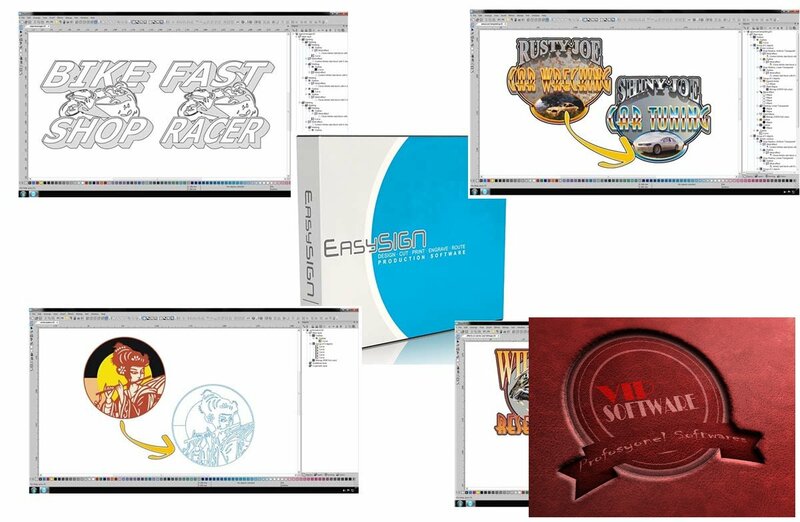 The EasySIGN Master is all about efficiently, never do the same work twice. Nondestructive design and production steps. Place for example effects on a vector object and bitmap simultaneously and each separate element remains editable. The template system that works. Edit text and elements though an easy to use wizard to change a template into a completely new design within seconds. Color trapping for reducing overlapping colors and saving material costs. One easy to use dialog for instant plot ready files. Merge text and objects, create one design and make any desired number of personalized duplicates in seconds. Accept input from text files, external file formats and databases. Object manager for drag and drop objects on any level of your design or production drawing or make changes at any level. All effects are recalculated automatically with preservation of quality and detail for output at any size. Accurate vectorization, with special vector editing tools, to turn a bitmap into a plot able vector object in minutes.